You might be fully aware that Europa is not only the satellite of Jupiter, the largest planet of our solar system but an important celestial object for scientists. The credit of its discovery goes to Galileo Galilei; he discovered Europa on January 8, 1610. But at the same time, another German astronomer Simon Marius was also able to discover Europa! Do you know that Europa is smaller in size than our own moon? In fact, its diameter is one-quarter of that of the Earth! Since it revolves around Jupiter, it is known as the moon of Jupiter. While its average distance from Jupiter is said to be 415,000 miles or almost 671,000 kilometers, Europa’s distance from Sun, on average, is staggering 777 million kilometers. Europa and three other moons Callisto, Ganymede and IO are known as the Galilean moons. At low magnification, they appear as stars in our sky! Being closer to Jupiter, Europa gets its major energy from this giant planet and not the Sun! While Europa is smaller in size than our moon, it is still bigger than Pluto, the planet of our solar system. Its diameter has been measured as almost 3100 kilometers. It is known as the smallest moon discovered by Galileo. At the poles, its temperature is higher than that measured at its equator, but it is known as a cold celestial object because its temperature ranges between -220 degrees Celsius and – 160 degrees Celsius. It completes its one revolution around Jupiter in three and a half Earth-days; its rotation on its axis is also three and a half Earth-days. This means the side of Europa facing Jupiter does not change! Europa could be a game changer for life-seeking projects launched by Humans. In one of the studies, it has been discovered that the oxygen generating rate at Europa is almost ten times higher than hydrogen – a surprising similarity with the Earth. These findings evoke hopes that life may exist in Europa’s oceans, or it could be one of the potential sites for life to evolve in our solar system, other than our Earth. Europa is unique in the sense that it has a high degree of light reflectivity. Why is it so? Europa possesses icy crust on its surface everywhere that helps increase its reflectivity index. Its reflectivity index has been measured as 0.64 – highest in our entire solar system among all of the moons. Europa is said to be a fairly young moon as its surface is somewhere between 20 million and 80 million years old. In contrast, Callisto, the other Galilean moon of Jupiter, is believed to be a few billion years old. While it has an iron core just like Earth, its interior is made of the rocky surface. Outwardly, it is surrounded by ice layers, which is said to be 60-150 kilometers thick throughout its surface. That is why Europa’s oceans do not exist at its surface as is the case on the Earth but lie underneath a thick sheet of ice with an estimated depth between 60 and 150 kilometers. Jupiter’s tremendous gravitational force creates tidal forces on the oceans of Europa that lies beneath the surface. The tidal waves rise higher than normal when Europa is closer to Jupiter. At that time, these tidal waves exert huge pressure on the surface of Europa causing cracks. Whenever Jupiter is visible, it is quite easy to view the moons of Jupiter including Europa. Using a low power eyepiece, you need to center your telescope on Jupiter. You need to focus carefully and patiently so that the planet’s edge becomes as sharp as possible. When vibrations settle down, it is quite likely that all four moons may be visible around Jupiter, but in some nights only two or three moons may be visible, especially when they are behind or in front of Jupiter. Also, Europa may not be visible if it falls on the shadow of Jupiter! Of these moons, Ganymede is a little brighter than other moons. In fact, Ganymede and Callisto are relatively easy to catch than Europa because they orbit away from the glare of Jupiter. 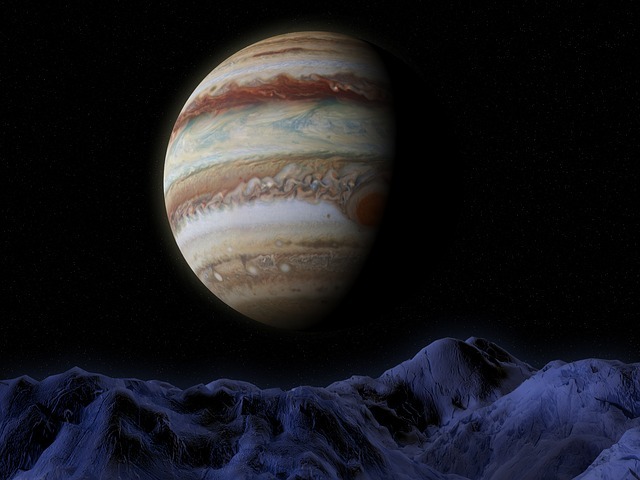 Do you know that Europa does not orbit Jupiter in a circular motion? Rather, it follows an elliptical path and therefore, its distance from Jupiter varies. It is obvious that the gravitational force of Jupiter to its near side is stronger than the one experienced at its far side. Due to this, strong tides are created in oceans causing fractures on its surface. According to experts at NASA, Europa might be witnessing hydrothermal or volcanic activities in the sea. This is likely to provide all the important nutrients necessary to support or evolve life. When the ocean is in contact with the rocky core, then a variety of complex chemical reactions take place. Life can evolve out of these chemical reactions in the same way as life evolved on our Earth! So far, in our entire solar system, there are no traces of life or any signs that life may evolve at some place outside the Earth. Hence, Europa’s importance has increased manifold! NASA has launched several missions to explore Jupiter systems including its moons. Pioneer 11, launched in 1973, passed through Europa at a distance as close as 600,000 kilometers. Photographs forwarded by this mission gave an indication of some variations on its surface. Voyager 1, launched in 1977 provided insights about the Jupiter systems that how the gravity of one moon affects the gravity of others! Voyager 2, launched in 1979, informed about brown stripes across the surface of Europa, which, according to the scientists, are cracks due to tidal pressures created in the sea. Galileo became the first man-made satellite of Jupiter on July 13, 1995. This mission revealed strong evidence that Europa has an ocean beneath the thick icy layer found on its surface. Galileo also gave an indication of the likely plume (water vapors) in 1997 when it was at its closest to Europa! NASA’s next ambitious mission is proposed in 2020, which will pass by Europa several times. It will attempt to find evidence for plumes spotted by the researchers working through Hubble telescope. If the mission is successful detecting plumes at Europa, then it becomes a strong candidate of a life-supporting environment outside the Earth! Astrobiologists are simply delighted with this news! For these reasons, the exploration of Europa has been ranked as the top-priority mission by NASA. Recently, in 2017, NASA has launched a mission called Europa Clipper with an intention to investigate how inhabitable Europa is! By investigating plumes, the chemical makeup of a subsurface ocean will be revealed. This will help ascertain if Europa has a habitable environment that can allow life to flourish. In addition, scientists are eager to discover if life in any form currently exists at Europa or not! As per Greek mythology, Europa is a King Agenor’s beautiful daughter. Taking the shape of a white bull Zeus (called as Jupiter by Romans) appeared before Europa. Being impressed with Zeus, she rode upon its back. Zeus took no time and ran away with her into the sea around the island of Crete. On plunging into the sea, Zeus got back his real shape. The legend has it that Europa bore Zeus many kids.